David Solomons' hilarious comics caper is both the winner of the Waterstones Children's Book Prize and this months Children's Book of the Month. 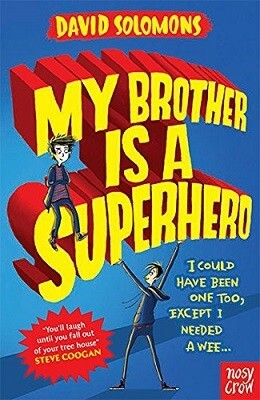 Since its release last summer, David Solomons’ rip-roaring adventure for children My Brother is a Superhero soon proved itself as a firm bookseller favourite, ultimately storming on to bag the overall winner in March of the Waterstones Children’s Book Prize 2016. A hugely funny riot of a book, Solomons’ debut is a hilarious descent into anarchy, launching from when desperate, wannabe-superhero Luke misses his galactic destiny by having to visit the toilet. With his unworthy brother Zack now the chosen one, will Luke have the wherewithal to rescue Zack from his arch-nemesis and save two universes? Anything this mirth-inducing makes it a particular draw for even the most reluctant of readers and we’re thrilled to have played some part in helping to establish Solomons’ debut as the classic it undoubtedly is. We can only hope the civilised world is ready for July’s upcoming sequel, My Gym Teacher is an Alien Overlord. Luke shares a treehouse with his geeky older brother, Zack. Luke goes for a wee and while he's gone an alien gives his undeserving, never-read-a-comic-in-his-life brother superpowers, and then tells him to save the universe! Luke is furious, but when Zack is kidnapped by his arch-nemesis, it's up to Luke and his friends to save the world.